Clean, sparkling bright and tidy surfaces within the premises of an office or some other commercial establishment help to uphold a good image of the business in front of clients. 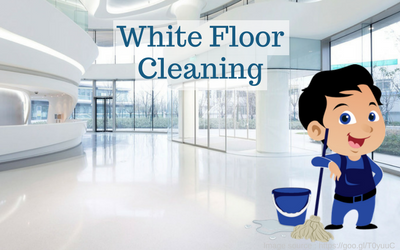 However, ensuring proper maintenance can become a whole lot tougher if you have white tiles laid out on your floors. This is due to the obvious reason that white tiles ensure greater visibility of dirt and dust accumulating on them. Of course, the best way to make them spotless is by opting for professional cleaning services in North Sydney. But until the experts are back for the second round as per schedule, it should be the duty of your staff to keep pollutants off the floor. This can do more good than application of strong chemicals or solutions on the tiles. First of all, the solid debris, such as large particles, pet droppings, hair, dropped packets, etc. need to be swept away. It is better to make use of brooms with soft bristles, as they would not create abrasions on the surface of the white tiles. Vacuum cleaners should be utilised for picking finer dirt and dust off the floor quickly. Diatomaceous earth is generally available as a moist clay-like substance. The best way to use it for white tile maintenance is by mixing it with any good, non-toxic and non-abrasive commercial cleaner. The mixture must then be applied on the tiles with slight pressure and allowed to sit for some minutes. Finally, it should be covered using a thin plastic sheet overnight and then removed for sparkling, white tiles. For this, you would need to mix 2 cups of warm or hot water with 1 cup of baking soda or white vinegar. Soak a dry & soft mop in the solution, and then have it used for scrubbing the floors. Alternatively, the solution can be poured into spray bottles and applied on the tiles directly. Thus, make sure you instruct your janitorial staff to implement the above mentioned solutions effectively until the time comes for the pros to take care of the maintenance task once again. If you found this post useful for your business, then don’t forget to share your views with us in the comment section below. And stay connected to our dedicated blog space for interesting stuff related to commercial cleaning.